Egg is one of easiest when finding nourishing and healthy foods. But many are tired of eating fried egg, sunny-side up, scrambled egg, and boiled egg, because of its daily familiar taste. Here's how to cook an egg just like that of a hamburger or hot dog. Since I travel a lot, I cook foods by myself and enjoy arranging tropical delicacies. Eggs can be cooked in any manners, but when it turns cold especially after so many minutes, it does not taste good at all. Is it not the reason that you are tired of eating eggs or you really don't like eggs anymore? In a small poultry in the province of Thailand, I saw a young wife cooking several kinds of dished-out eggs, just to entertain a group of visitors. 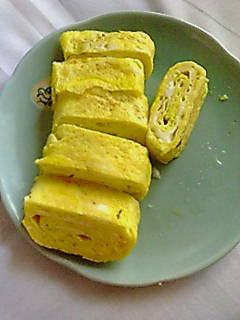 One of her egg delicacies, omelet-like egg was so tasty even after so many hours of cooking. Immediately, after I returned to my home country, I tried to duplicate the way she cooked the egg. It was so good, then, I tried to modify her cooking technique to be applicable in modern kitchens. You can add this juicy, chewy, and tasty omelet-like egg to your healthy recipe. Prepare about three medium-size eggs and beat it in a bowl. As for stirring the egg well, crumble up the white body of the egg to catch the air bubble. The important technique here is to cut (not beat) the white egg portion. A minute of beating and cutting is good enough. Prepare any chicken, beef, pig, bonito, or shrimp of bouillon with 3 tablespoons of warm water. Dilute the bouillon in the warm water. In Thailand, we used chicken soup extracted from chicken bones. Aside from the above, you need a teaspoonful of soy, and a little salt and sugar. Mix the above altogether with 3 eggs beaten. Make sure that your frying pan is at about 180 °C or 356 °F. Pour one half of beaten egg to the frying pan and roll it. 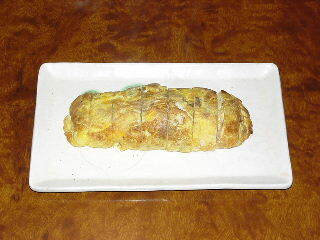 When it is about to be toasted, pour the rest of egg, roll it, and cut with a knife, like below photo. You will never forget the taste of this kind of omelet-like egg. Air and tasty bouillon juice trapped inside the egg is so juicy, chewy, and tasty. Yes, an important thing here is to trap the air and the juicy taste inside the egg. In supermarkets, you can find various tastes of bouillon easily to select your taste of the day. So let's start cooking. It's no longer the same taste as you know before.